The final draft proposal of a state plan to increase water flows through the Tuolumne River for the benefit of fish and wildlife was released in July with little changes, despite vehement opposition from a broad coalition of local governments and organizations. In an effort to prevent an “ecological crisis,” the State Water Resources Control Board released its third and final draft of the Bay-Delta Water Quality Control Plan update, which calls for allocation of 40 percent of unimpaired flows along the lower San Joaquin River and its tributaries — the Stanislaus, Tuolumne and Merced rivers — to help rehabilitate the area’s native fish species. Many farmers and local water agencies feel as if the State Water Board has indeed waged a water war on the San Joaquin Valley. The first draft of the plan, which also included 40 percent unimpaired flows, was released in September 2016, and in December 2016, hundreds of locally-elected officials, water and agricultural leaders, agency representatives and community members addressed the Board in Modesto, sharing the potential impacts the water grab could have on the farming community. The Worth Your Fight campaign over water usage has been reinvigorated since the State Water Board released their final plans for the area’s rivers. As detailed in the final draft proposal, the State Water Board proposes increasing flows to provide habitats for fish and wildlife upstream of the Delta from February to June, which are the critical months for protecting migrating fish on the Stanislaus, Tuolumne and Merced rivers. A 40 percent unimpaired flow requirement, within a range of 30 to 50 percent, is proposed because “it can improve conditions for fish and wildlife considerably without more challenging impacts on other water users,” according to the Board. The Board added that the local native fish population has declined dramatically, bringing some species to the brink of extinction. For example, approximately 70,000 fall-run Chinook Salmon adults returned to the San Joaquin Basin in 1984 but only 40,000 were counted in 2010. As of 2014, that number had fallen to 8,000. Last summer, Turlock Irrigation District endorsed an alternative plan, the Tuolumne River Management Plan, to help save the area’s native fish, which includes stream-bed gravel restoration, predator control and the strategic placement of rocks and trees along the river to provide a better habitat for fish migrating up the Tuolumne, rather than the increased flows proposed by the State Water Board, in addition to various other methods. In order to demonstrate the implications of the unimpaired flows, TID, along with Modesto Irrigation District, looked at data from 2015 to determine that the state’s plan would lead to $1.6 billion in economic output loss, $167 million in farm-gate revenue loss, $330 million in labor income loss and the loss of nearly 7,000 jobs. 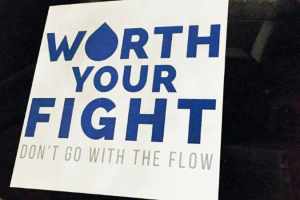 Through the Worth Your Fight campaign, TID and MID spread the word about when and how community members could voice their concerns to the State Water Board. 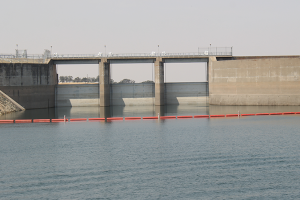 In March 2017, MID and TID filed joint comments which addressed issues with the proposal and the $30 million worth of research the agencies put into the science behind their alternative plan, which was conducted through the relicensing of the Don Pedro Dam. The variability in the proposed flows allows the Board to annually review and make changes if necessary, Board staff said, such as in the event that non-flow measures implemented by water agencies do have positive impacts on the fish population. According to TID and MID, the Tuolumne River Management Plan is anticipated to increase fall-run Chinook salmon production over two and a half times the current production. The Worth Your Fight campaign alone submitted 6,589 public comments to the Board in opposition of the proposal, and in a joint statement from the campaign, TID and MID expressed frustration at the fact that little has changed in the updated, final draft of the plan despite the public’s worry. Prior to Friday’s release of the final draft proposal, the State Water Board held its longest public comment period ever, which ended March 17, 2017. Since then, the Board has been working on the final draft and following its release is now asking for written comments on any changes until noon on July 27. “Apparently after a year of review and edits, the State Water Board feels it only needs to give our region 21 days to review and comment on the latest draft,” TID and MID’s joint statement said. 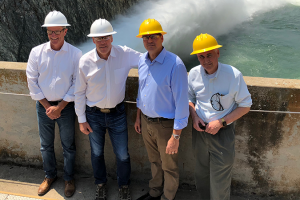 (Pictured left to right) Turlock Irrigation District Assistant General Manager Steve Boyd accompanied Interior Secretary Ryan Zinke, Congressman Jeff Denham and Congressman Tom McClintock on a tour of Don Pedro Reservoir and New Melones Lake on July 20. The two districts joined other water agencies to petition the State Water Board to allow more time for commenting on a “proposal that will drastically impact our communities,” but their request was subsequently denied by the Board. Along with TID, local legislators and even the federal government have sent requests to the Board to extend the comment period and postpone their decision. In a July 19 letter addressed to State Water Board Chair Felicia Marcus, Assemblyman Heath Flora (R-Ripon), Assemblyman Adam Gray (D-Merced), Senator Anthony Cannella (R-Ceres), Senator Cathleen Galgiani (D-Stockton) and Senator Tom Berryhill (R-Modesto) called on the board to extend the public comment period for the Bay-Delta Plan and to delay the board’s Aug. 21-22 hearing, where they will consider adopting the plan. The group of lawmakers believe the Bay-Delta Plan ignores stakeholder concerns and dismisses expert scientific testimony, they said, adding in their letter that a 21-day comment period is inadequate. On July 20, Interior Secretary Ryan Zinke visited both Don Pedro Reservoir and New Melones. About a week later, the Department of Interior issued an official comment to the State Water Board. Marcus said that a settlement without increased flows isn’t possible but hopes that all stakeholders can come to an agreement. If the State Water Board does not postpone their hearing, it will take place Aug. 21-22 in Sacramento. Local opposition groups are planning to rally on Aug. 20 on the steps of the State Capitol in protest of the plan, and more information can be found at www.worthyourfight.org.